Railpictures.ca - A.W.Mooney Photo: Not the sort of scene a Climate Buff would care to see, but this display of MLW smoke as a treat for us fans on the hillside overlooking The Junction. VIA #75 is westbound, the time is 1810Hrs and it is a very warm and humid eve. THAT I remember. 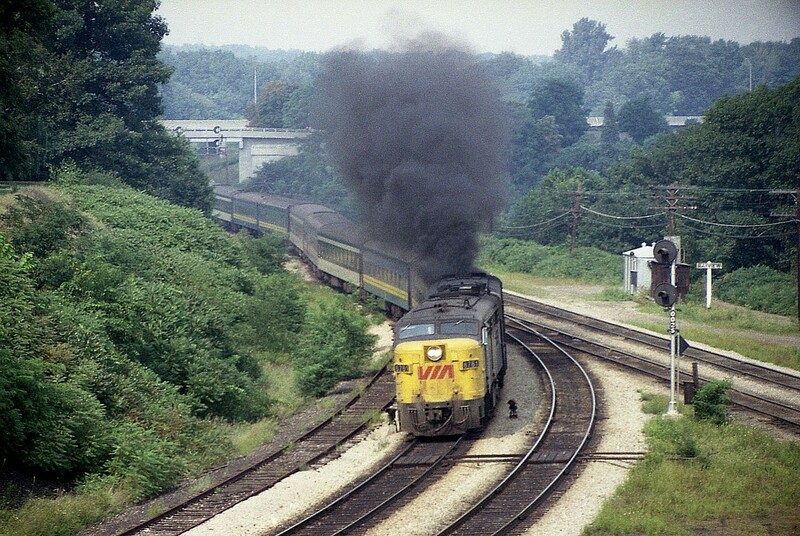 VIA 6761 leads, trailing 6871 smokes. Perhaps it still smokes, as the offending unit now toils for the Grand Canyon Railway as their 6871 !! I count 9 coaches on a rather short train in this image, another of a series I had taken 40 VIA years ago. August 23rd was a Wednesday………… | Railpictures.ca – Canadian Railway Photography – photographie ferroviaire Canadienne. It was very late that day. I know not why, I just know that is the time I jotted down in my notebook. And usually I only made note of the time when it was abnormal. Train 75, in my 1996 Trackside Guide, was named the ERIE. If you shot it at 18:10 it was quite late that day. In 1996 it was due into London at 18:24. It wouldn’t get from Bayview to London in 14 minutes. Was it late or have the schedules changed over the years?